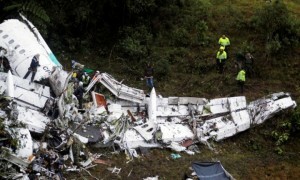 MEDELLIN - Errors by the pilot, airline and Bolivian regulators are to blame for a plane crash in Colombia that killed 71 people last month, including most of Brazil's Chapecoense soccer team, Colombia aviation authorities said on Monday. His son Gustavo Vargas Villegas, a former official with Bolivia's aviation authority, is also being held on charges that he misused his influence in authorizing the license of the plane that crashed. He also says he is innocent.